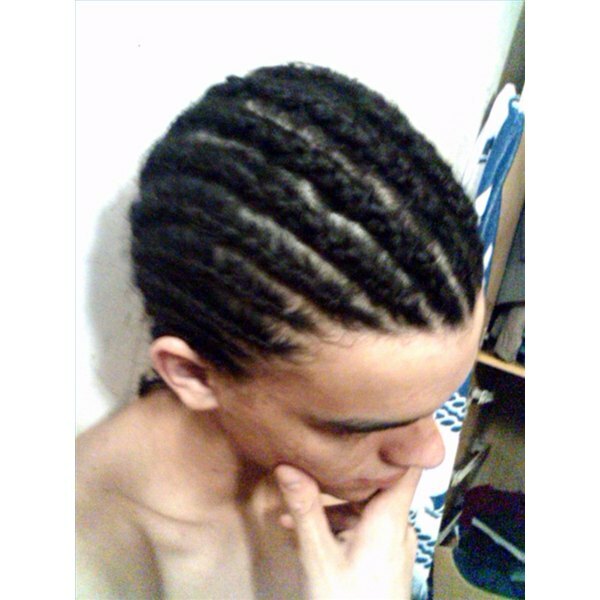 Cornrows are a popular braiding option for men. One of the most interesting ways to style men's hair is with braids. Braiding is not often seen on men, but it can prove to be an efficient, practical and good-looking style to sport. Men living an active life can get the most out of braiding, because it will keep your hair away from food, out of your face and from creating any other hazards. Cornrows are worn very close to the scalp. It is the most creative braiding technique, above all others. Cornrows may be made in many different shapes and patterns, creating a swirling image over the scalp that borders on artwork rather than hair care. The rows are sometimes decorated with beads and shells. Cornrows are difficult to achieve and do require a long braiding process, however, when finished, they are easy to maintain for quite a long time. Historically, cornrows have been worn by Sub-Saharan Africans, who also employed the artistic geometric shapes and patterns, but for them they were signs of wealth, status and family lineage as well as other things. Braids on men can be used to keep hair out of the face or they may be used to create another hairstyle. One way to dread hair is by using braids to begin the dreads. Braids can also be used to weave extensions into hair. Traditionally, Native Americans used braids to signify status and for religious purposes. The cutting of a braid could represent a great amount of shame or guilt. Controversy surrounds the topic of braiding and long hair on men in the Christian community. Some have interpreted the Bible's teachings that men and women must strive to look different to mean that these hairstyles are sacrilegious.